OP/TECH Pro Camera Grip Strap for Nikon Digital D50 D70 D100 D200 D2H D2X etc. 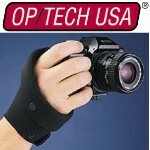 The OP/TECH GRIP STRAP™ offers a secure system for carrying any Digital SLR camera in the hand. It’s ideal for photographers on the run who want their cameras always "at the ready". If you are like that but your hand gets tire of holding your camera for extended periods of time this is for you. It holds your camera in your hand for you! 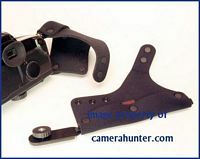 The metal base plate has a rubber pad to protect the camera’s finish and uses a case screw to firmly attach to the tripod mount area of the camera. The GRIP STRAP™ is then secured to the base plate and one of the camera attachment areas. As an additional split ring is incorporated into the GRIP STRAP™, the user can still attach a neck strap to the camera for added versatility. The GRIP STRAP™ is adjustable to fit snugly across the back of the hand and attaches comfortably around the wrist with snaps. 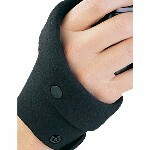 This dual system provides a comfortable and secure strap. This is one of those great camera accessories that will stay with you no matter what camera you choose. You can switch from one brand of camera to another or from film to Digital and use this on your new camera.